Whales are among the largest, most intelligent, deepest diving species to have ever lived on our planet. They evolved from land-roaming, dog-sized creatures into animals that move like fish, breathe like us, can grow to 300,000 pounds, live 200 years and travel entire ocean basins. Whales fill us with terror, awe, and affection--yet there is still so much we don't know about them. Why did it take whales over 50 million years to evolve to such big sizes, and how do they eat enough to stay that big? How did their ancestors return from land to the sea--and what can their lives tell us about evolution as a whole? Importantly, in the sweepstakes of human-driven habitat and climate change, will whales survive? Nick Pyenson's research has given us the answers to some of our biggest questions about whales. He takes us deep inside the Smithsonian's unparalleled fossil collections, to frigid Antarctic waters, and to the arid desert in Chile, where scientists race against time to document the largest fossil whale site ever found. 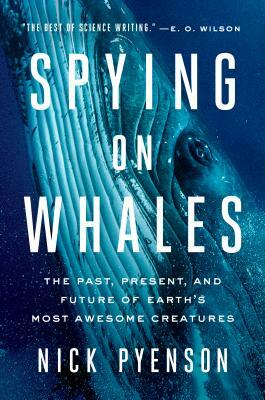 Full of rich storytelling and scientific discovery, Spying on Whales spans the ancient past to an uncertain future--all to better understand the most enigmatic creatures on Earth. Nick Pyenson is the curator of fossil marine mammals at the Smithsonian Institution's National Museum of Natural History in Washington, D.C. His work has taken him to every continent, and his scientific discoveries frequently appear in the New York Times, the Washington Post, National Geographic, Los Angeles Times, The Economist, Popular Mechanics, USA Today, on NPR, NBC, CBC, and the BBC. Along with the highest research awards from the Smithsonian, he has also received a Presidential Early Career Award for Scientists and Engineers from the Obama White House. He lives with his family in Maryland.